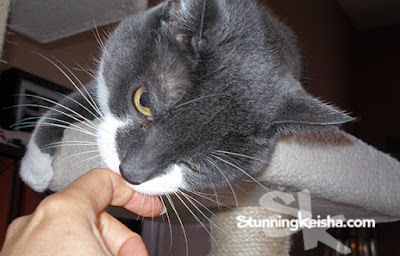 First I put my paw out to scratch her hand. Except for the look on my face, you wouldn't know I was up to no good. What do you mean by that, Woman? My look is pure innocence. Then I went for the bitey. You prolly can't see all the scars on her hand but I see them and I'd like to add more. We "might" be playing here but trust me we she wasn't playing when she got those scars although I was. Last week I promised to share a story of TW's betrayal. I don't want to leave you hanging but since there's no photos, there's no separate post. 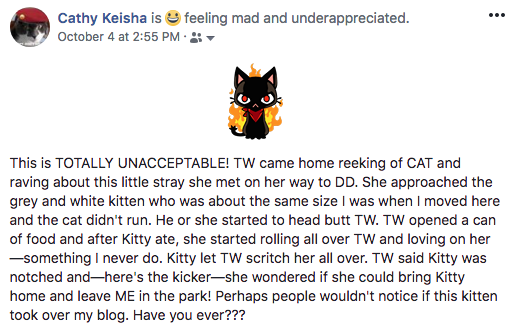 This is what I posted on FB but it's turned out that Kitty hasn't been seen since that fateful day. Could that have anything to do with my sending my bois out to warn him/her to stay away from TW? Let's go with Kitty got rescued or the owner found her/him. Can you believe TW's onions? 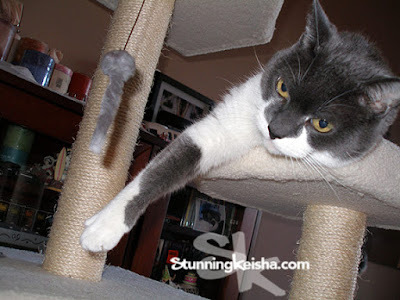 You guys would notice a fake kitty taking over this blog, wouldn't you? We know all about the bite-y in this house! And Bear swats at passing humans as well. I know this goes against everything you are, CK, but you are still pretty adorable on your tree like that. My human had a semi-feral cat once that she said, "Played for keeps." I think you are kind of like that, CK. You need to be nicer to your mom. Just saying. That's why she loves on other kitties. How could she betray you like that! I do hope the little kitty is okay though. How dare she! But if you're not giving her kitty love like that, she's got to take it where she can get it. Think you might be Teddy's long lost Auntie! You kitties could be twins! We know all about the bitey face in this house and yeah, we would notice and be mad, too. That's like trying to replace the Mona Lisa with a replica. I'm pretty sure people would notice.